Very often, changing the locks on your home can be paramount for security and peace of mind. You always have to ask yourself if you know who might have a copy of your keys. If you don’t feel comfortable with the answer to this question, changing the locks is something you should really consider. Changing the locks doesn’t necessarily mean you have to pay a great deal of money purchasing new hardware. The smarter way to go about it is to re-key the locks instead. “What is re-keying the locks?” you might ask. When we re-key, we replace the pins on the existing locks to match a completely different set of keys. By doing that we can make sure none of the old keys or any other key for that matter will be successfully used to gain entry to your home. This is an inexpensive solution to get complete control of who has a key to your house. Moving to a New Home - God knows how many contractors, realtors, friends, family and neighbors the old owner has been giving copies of your keys. After Giving a Copy to a Stranger - Maybe you gave a copy to a contractor or even the cleaning service you just fired. 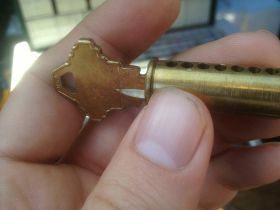 Even if they gave you their key back, it’s possible that they made copies at the hardware store without your knowledge. Domestic Disputes - Sometimes the people closest to us are the ones that can cause the most harm. An ugly divorce, a relative with addiction problems or any other family conflict can leave the wrong people with a key to your house. Change of Tenants - If you’re a landlord, for the safety and peace of mind of your new tenants, make sure eliminate the chance of letting the old tenants have a working key. Matching Locks to the Same Key - As long as the keyway of the locks match, they can be re-keyed to match the same key. Too many keys on your keychain not only make a number on your pants, keeping track of which goes where can be a real annoyance.